Casada Deluxe Maxiwell Massager Cushion has NEW Features, massagers in 2 directions and 2 speeds. 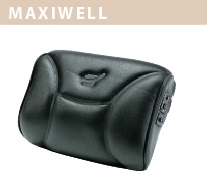 Casada Maxiwell Massager Cushion has been designed with the input of physiotherapists and massage therapists. There are four massage heads in the cushion, two on either side. All four massage heads work at the same speed and action. It gives you the feeling of the heal of the thumb and the tip of the thumb. You control the depth and pressure by using your own body weight.